Billy Johnson, 20, of Ripon Court, was convicted along with accomplice Charles Noble, 21, from Ealing in London. A 47-year-old man from Rugby has been arrested on suspicion of possession of a controlled drug with intent to supply. 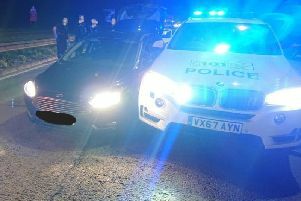 The man was arrested after his vehicle was stopped on Railway Terrace at 12.30pm yesterday, Thursday. A quantity of drugs, believed to be cannabis and amphetamines, were subsequently found in the vehicle. A further search of the suspect’s home uncovered more drugs and £7,000 in cash, all of which were seized by police. The seized drugs are believed to have a street value of around £8,000. The man has been bailed until the end of May while investigations continue. If you want to report drug-related offences, contact police on 101.